Shower cap in cute daisy flowers print. Keeps your hair dry in comfort. Luxury women’s shower cap made in Australia from laminated cotton. One size fits most hairstyles. The reusable shower cap that will wash and wear shower after shower. Comfortable and light to wear. 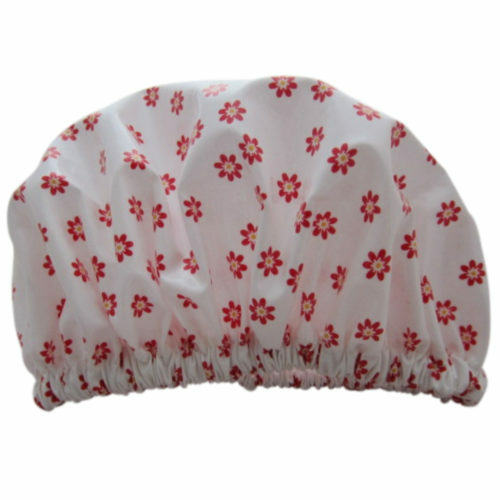 Shower hat is handmade in Australia from laminated cotton. Outside of cap is waterproof smooth laminated cotton. Keeps hair dry and protects your hair. Long lasting ribbed elastic is sewn into the edge of cap. This makes the cap hold its shape well over time. Strong fabric is machine washable. This shower cap will take repeated washings and is the reusable alternative to disposable plastic caps.